Looking for a critical thinking activity to help your students with math vocabulary? The “Vocabulary Dominoes” activity requires students to compare and contrast terms, as well as, look for, analyze, justify, and communicate about relationships among the terms. 1. Group students in groups of three. Assign students to be Student 1, 2, or 3. Note: This activity works best with at least 16 dominoes for a group of three. 2. Students spread out the face-down cards. 3. Each student takes 4 dominoes. Place the remaining cards in a face-down stack. 4. Student 1 turns over one of the remaining cards to use as the starter domino. 5. In turn, each student tries to connect one of the words on his/her domino to an end and justify the connection. If no connection is made, the student takes a card from the extra pile and tries to make a connection. If no connection can be made, the turn is lost. 6. The first student to place all of his/her dominoes is the winner. 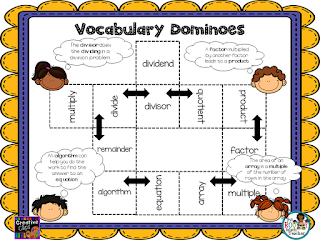 Click here or on the image above to grab a free copy of my “Vocabulary Dominoes” template. To use the download: Insert the image into a Word document or PowerPoint slide. Just add a text box with each word you want to add and place it in the center of each half of the domino. Head on over to The Routty Math Teacher website and read more about using Vocabulary Dominoes as an assessment strategy here. And, while you’re there, grab a free copy of my vocabulary activites eBook. Check it out here!